With the built-in action wizard editor. 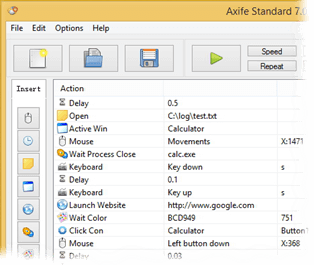 Axife is very easy to use, so that even a novice user can use it. Usually, you simply click Record, do your work, and click Stop when you are done. Then you click Play, and it repeats your actions as many times as you wish. It not only can records mouse and keyboard event, it also provides a large number of useful extensions to deal with complex work. Perfectly compatible with Windows 7, Windows 8, Windows 10 and 64-bit systems.